You'll need lots of patience to overcome Sway's learning curve. We're always on the lookout for cool iPhone games, so it's no surprise that we immediately downloaded Sway. Illusion Lab's touch screen controlled swing fest garnered heaps of praise and we were drawn to its impressive 3-D graphics and cute characters, but unfortunately, we couldn't get into it. That's what happens after dying more than 20 times in five minutes. Sway bears a slight resemblance to Nintendo's Donkey Kong: King of Swing in the sense that you swing characters to goals and collect stuff along the way. Except instead of using shoulder buttons to grab pegs, you draw imaginary circles with your fingers and then let go to send Lizzy the Lizard flying. 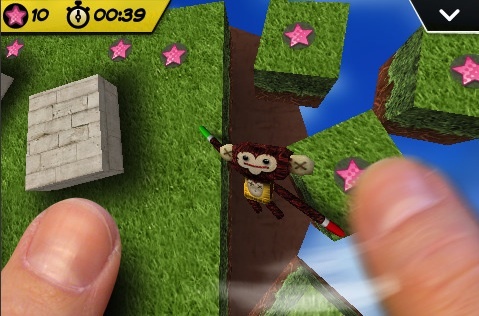 Once airborne, you quickly press the screen and Lizzy attaches herself to an object, allowing you to repeat the process until the stage is complete. As you progress, you'll need to clear gaps, latch onto moving platforms and overcome raised objects; and if you're adventurous, you can hunt for keys and unlock characters. Success depends on your understanding of Lizzy's trajectory and the power of your swings. Spin her too fast and she'll zip into orbit. Spin her too slow and she'll plummet to her doom. Achieving the right balance, however, ultimately ruins the game because it forces us to abide by a strict set of rules when all we want to do is fire up that lizard and let her rip. Since we cannot see what lies ahead, this often leads to death, making Sway an annoying game of trial and error. In addition, we encountered a bothersome glitch where Lizzy came to rest on a ledge and we were unable to control her; the game failed to read our circles. Sadly, we had no other choice but to restart the app. On the positive side, Sway features adorable characters, cheery music and detailed 3-D stages. Lizzy and her huggable friends always have smiles on their faces, and gamers willing to get over the learning curve will find a plethora of challenging levels. In some respects, we can see why so many folks like this game. Illusion Labs did a nice job bringing an attractive 3-D game to iPhone, but the innumerable deaths and that frustrating glitch disappointed us. If Sway appeals to you, we suggest waiting for a price drop. What's Hot: Cheery characters, challenging levels, neat comic book style presentation. What's Not: Steep learning curve, random glitch prevents you from swinging.